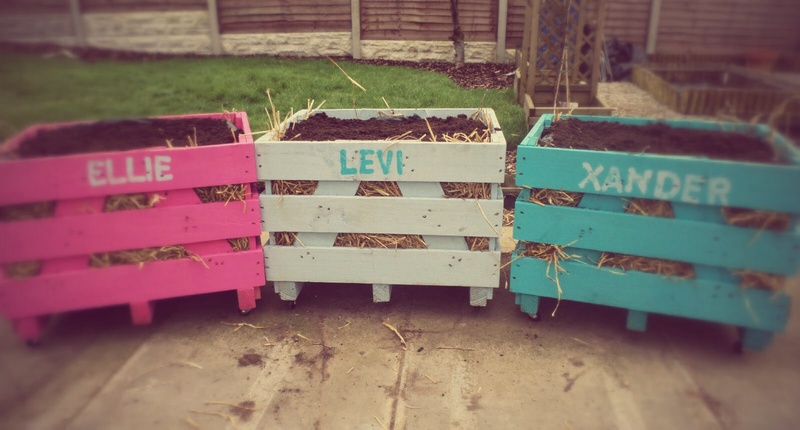 A fairly quick and easy pallet build that I completed over a couple of weeks in 2016. It was mainly used as a bike shed but could just as easily have been utilised for other sorts of storage. Lately I’ve been working on a new pallet carnival stall design for my son’s carnival themed birthday party. So far I’ve completed three with another two to go. The original stall I made back in April was more of a fascia than an actual stall. 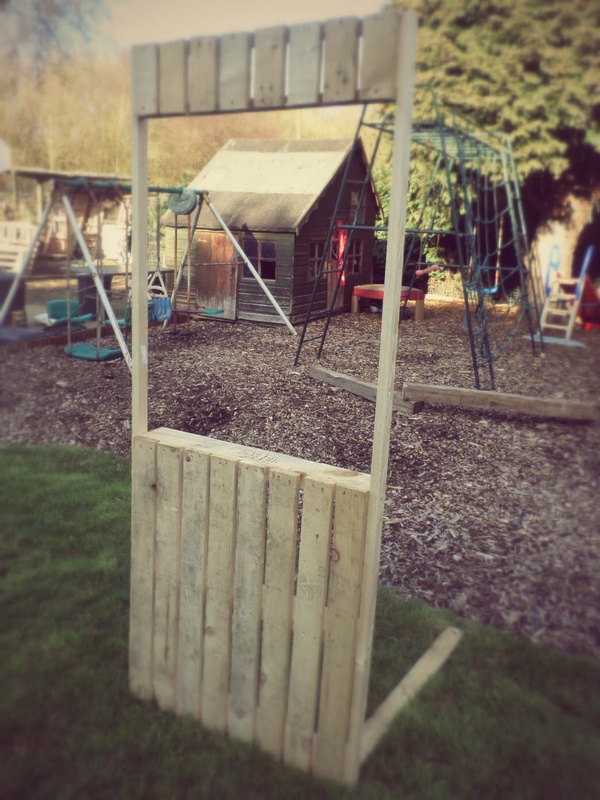 I used a full pallet and fastened two posts to the side which supported a small marquee made from small pallet pieces. 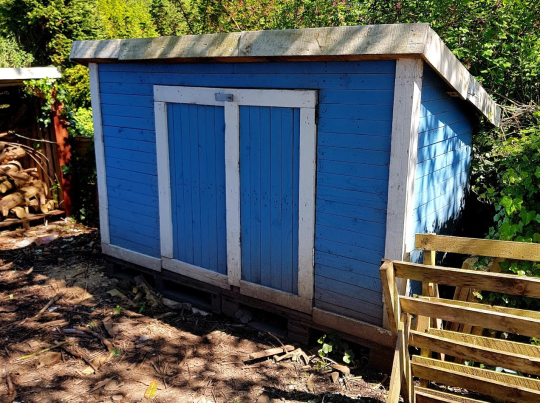 The two problems I encountered with this design were stability (the stall had a tendency to topple over, even when I attached feet to it that could be pegged in the ground) and painting (the gaps in the pallet boards were very awkward to paint). 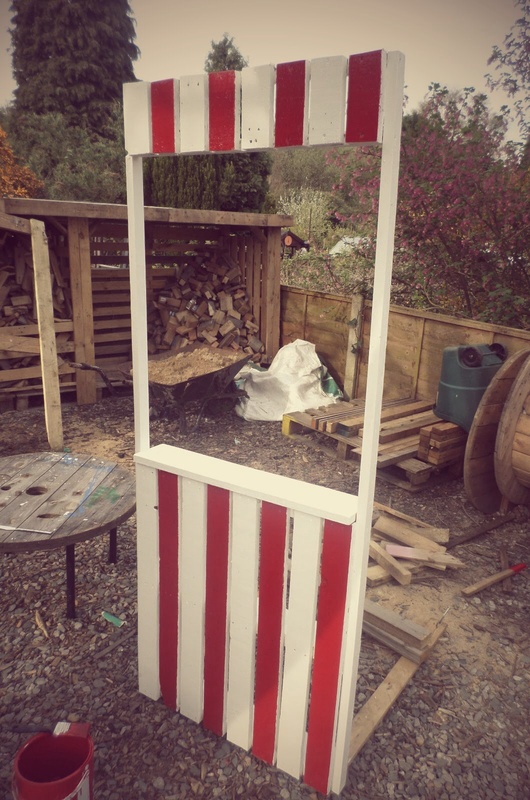 The next stall I made was for a local youth centre who wanted a carnival style snack stall for their birthday celebration party in June. This time I completely dismantled the pallet and built it up again from scratch, making sure the boards were flush together to facilitate painting. I also included small sides to give it a more authentic stall look and added stability. 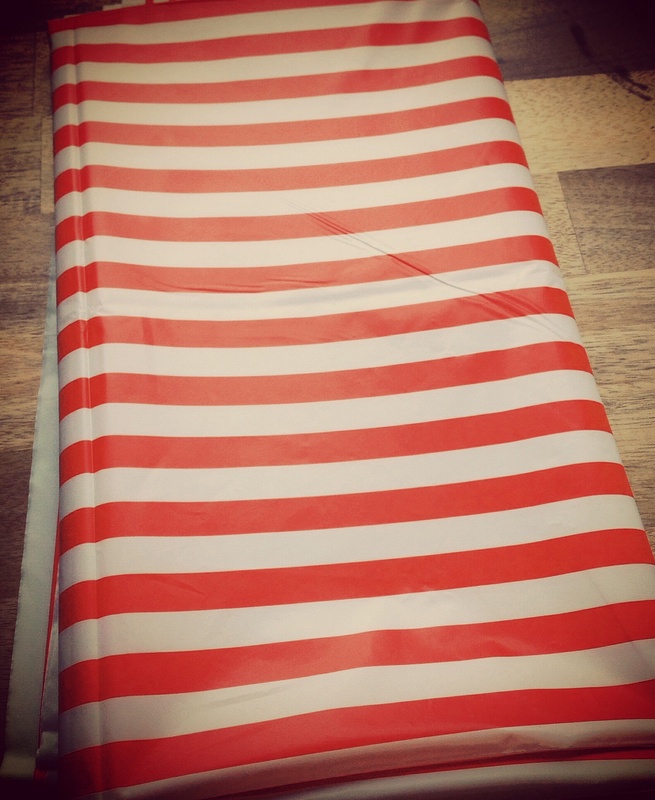 For my third effort I had bought a £3 striped table cloth to try as an alternative to painting the stall (undercoat and gloss are both time consuming and costly). With this method I didn’t need to worry about gaps in the pallets as the table cloth would cover them. I spent a couple of weeks bringing home the pallets I needed, some of which were used in full, others dismantled for the sides and marquee. First I attached a couple of feet to a full pallet. Then I made the stall sides from pallet boards and blocks. Next, the marquee went up, using long pallet boards for the posts and shorter ones for the marquee frame. Then I painted the posts and finished off by stapling the table cloth (in two parts) to the fascia of the stall and marquee. A couple of months ago I had the idea of using pallet wood as a cheap lawn edging solution. Lawn edging is something I’d wanted for a while but with around 80m to cover the cost was always prohibitive. 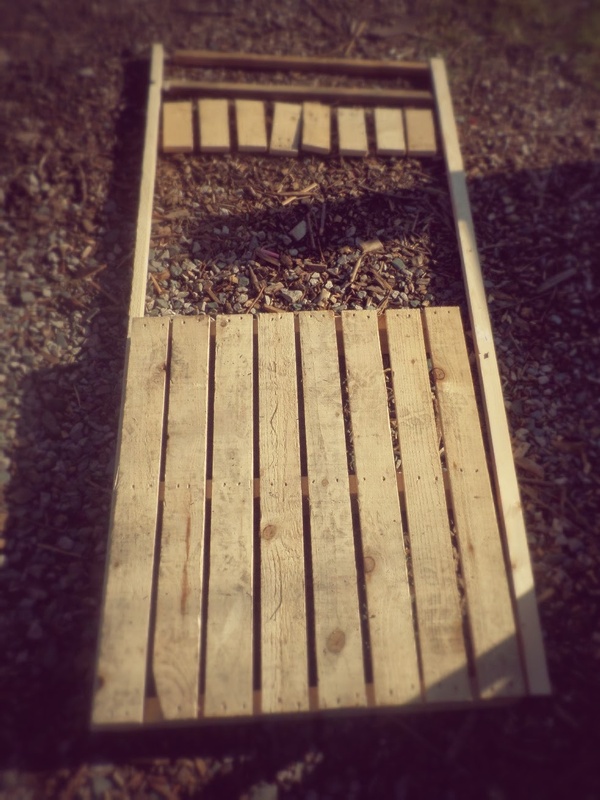 When I first thought of using pallets I tested out some self made stakes along a metre stretch and really liked the results. So, for the last two days I’ve been making hundreds of pallet wood stakes and making my way around the lawn. I think the result is great! The wood is untreated so it won’t last forever but since pallet wood is free and these stakes are so easy to install I didn’t consider the benefit to be worth the cost and effort of treating it. A few weeks ago I saw a post on Pinterest that planted the seed of an idea to create some crazy golf holes in the backyard. Since then I’ve been mulling it over, letting the idea grow and keeping my eyes peeled for scrap or bargains that could contribute to the project. Before too long I had some multi-coloured golf balls and a couple of putters my dad spotted at a second-hand shop. Then I found some rolls of green matting on offer at Lidl for a very reasonable £3 per metre. I even found myself in possession of a miniature windmill! The project was definitely starting to come alive, but I still had no materials for the construction of the course itself. The trouble was I needed some very strong and sturdy sheet wood that would provide a smooth, flat playing surface and be able to take foot traffic. Thick chipboard or hardboard would be ideal, but that stuff is expensive! Then I hit the jackpot, and it had been under my nose all along. At the industrial estate I visit when looking for scrap wood I saw a huge pile of sheet wood and pre-made wooden frames. I must have driven past it a dozen times, at least, but I’d always been so focused on sourcing pallets and cable reels that I never thought about it’s potential utility. 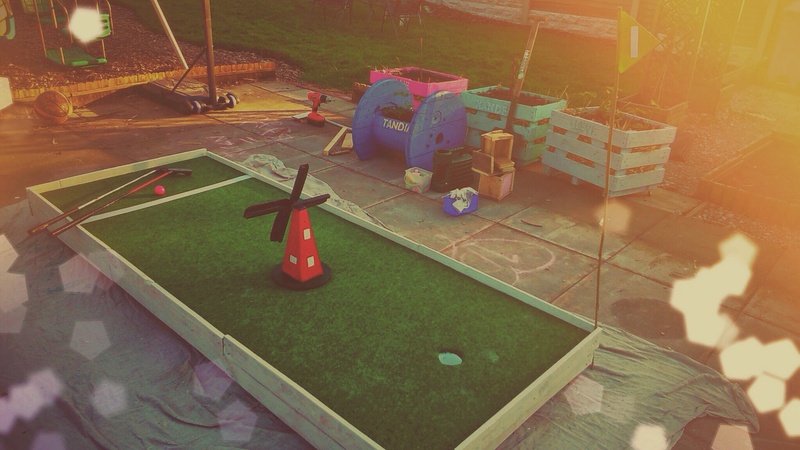 When I saw it a few days ago I got that lightbulb moment and realised how great it would be for crazy golf. As soon as I got home that day I set about turning the raw materials into a crazy golf hole. I kept the design simple for my first attempt (oh yes, there will be more): a bog-standard rectangle with the windmill to navigate around. Scrap wood was used to raise the frames off the ground, then the sheet wood laid on top of this and fastened down with screws. 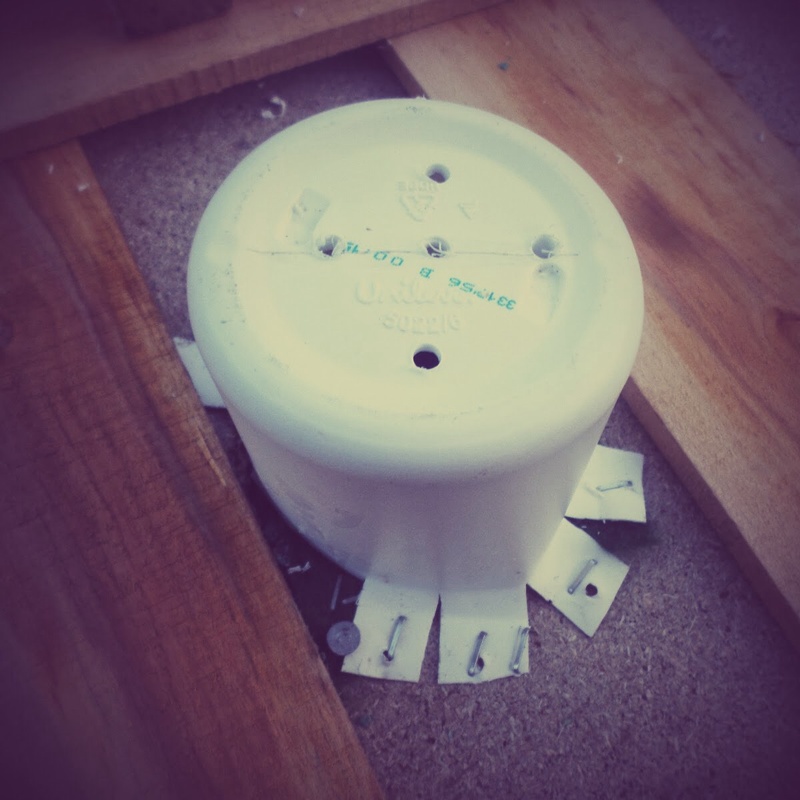 I cut out a hole for the hole cup (half of an empty shampoo bottle) and then attached the “grass” with staples. For the edges I painted some pallet boards in white (or rather, Cuprinol’s Pale Jasmine) and screwed them onto the sides. For the finishing touch I fashioned a flag out of an empty lawn feed container and attached it to a bamboo cane. The end result looks great and has proven very popular with the family! We’re all very excited about making some more! Remember, you can see Backyard DIY projects as they progress by following me on Instagram, and keep up with my activities by following me on Twitter. 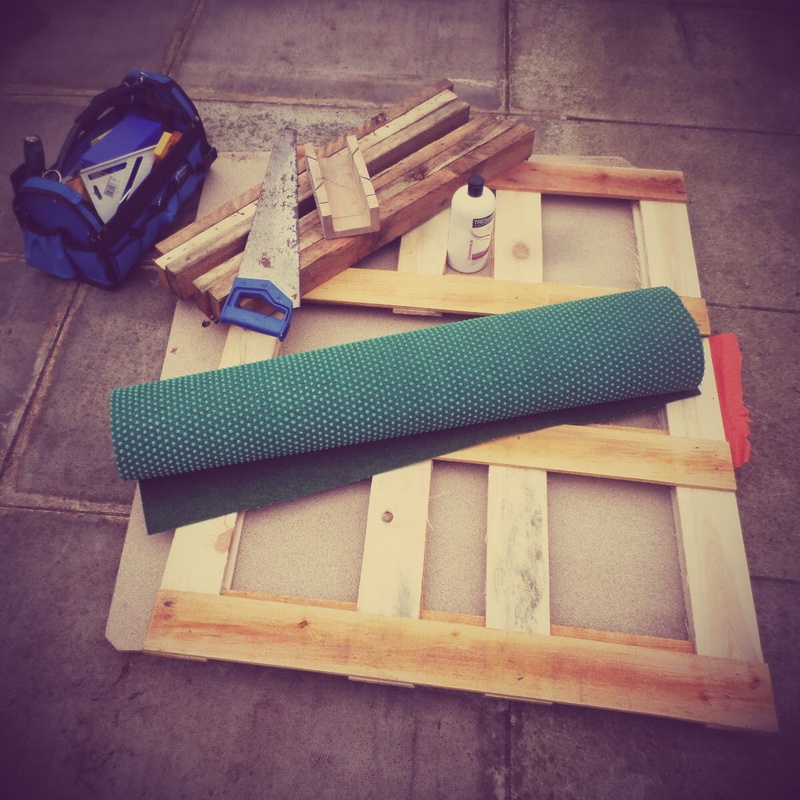 Alternatively you can follow the hashtag #BackyardDIY on either of those platforms. 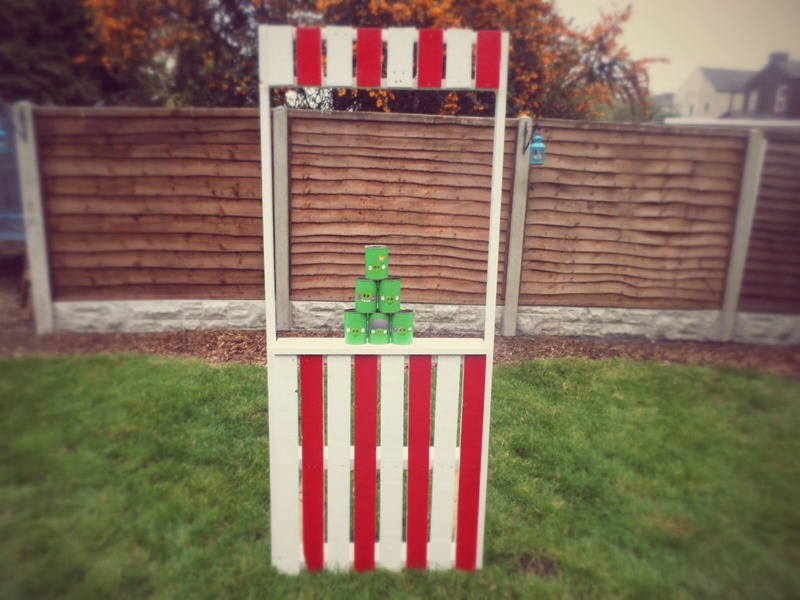 You may remember how I’ve been rather enthused about making a carnival themed party for my son’s birthday, and how I got all crafty and recycled some empty tin cans into an Angry Birds carnival game. Well, I recently finished one of the stalls which that game, along with a few others (fingers crossed), will occupy. 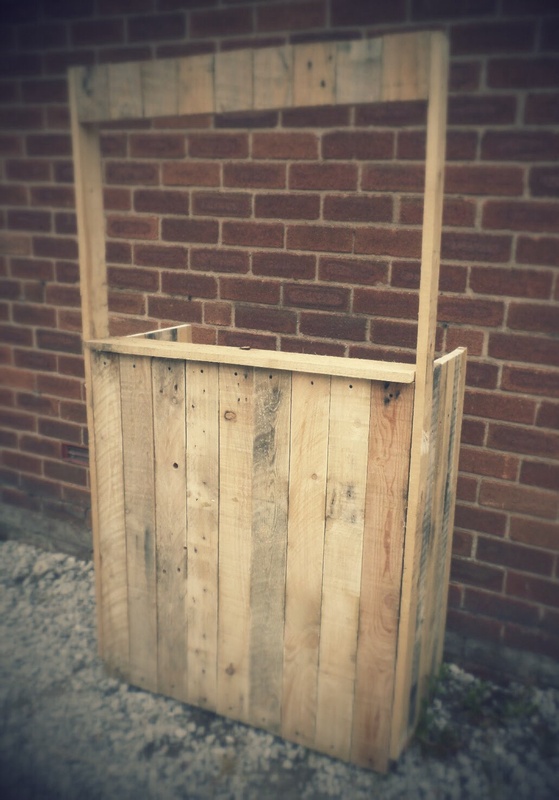 I started off with a small pallet (60cm wide by 70cm tall) that I had reclaimed and put aside for this project. It’s the perfect hight for a stall facia and the boards are nice and close. I ran 6ft beading up the sides to support the marquee that would be positioned above the stall front. The marquee itself I made from scratch, attaching pallet boards to smaller pieces of beading. Once it was put together I had to wait for a dry spell to paint it (one day for undercoat and one day for gloss). My son is really excited, and well, I am too! Hopefully I can knock a few more of these together before his birthday in late July, and of course make a few more games to go with them. Lessons learned: it would probably be easier to build from scratch, simply because trying to paint alternating colours onto a pallet with close boards is quite fiddly and time consuming, and getting your brush between the pallet boards is next to impossible. Next time I will try painting loose boards and then put them all together when they are dry. 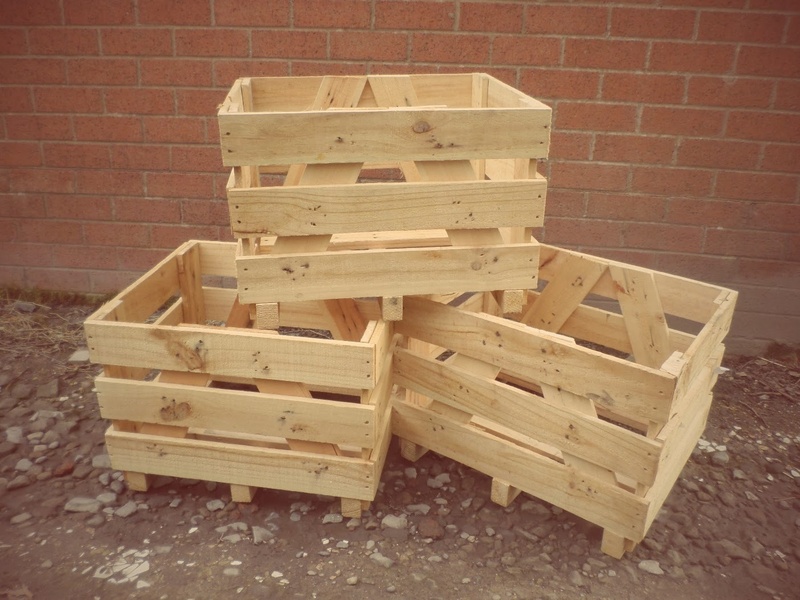 A couple of weeks ago as I was driving through one of my regular pallet hotspots I found these crates. Straight away I thought “ready made planters” so I loaded them into the car (after getting permission from the friendly industrial estate resident whose cast-offs they were) and took them home. I sanded them down and we had a great night in painting them. The colours are courtesy of Cuprinol Shades (which happened to be on a 3-for-2 offer I picked up) and are great for adding a bit of colour to the backyard. I decided to give the crates an inner lining of straw so that the plastic lining wouldn’t show through the gaps. I think it gives them a nice rustic look that balances their bright colours. The final touch was to print the kids’ names on with sponge letters I found for 99p. Tomorrow we plan to buy fruit plants and get growing! Trying to get my thumb green, and going in the deep end!